Micro-machining is an advanced manufacturing technique of growing importance, and adoption of micro-machining using electrochemical discharges (Micro-ECDM) has increased steadily in recent years. Among new developments is the interest of industry in Micro-ECDM. However, the potential of the technology is not being fully utilized and there is no comprehensive reference book available today covering it. 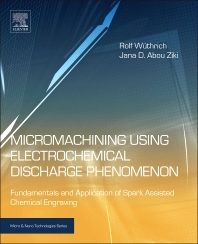 Micromachining Using Electrochemical Discharge Phenomenon, Second Edition fills this gap. It is unique in its detailed coverage of all aspects of the Micro-ECDM process, as well as Spark Assisted Chemical Engraving (SACE). As such, it covers technologies such as chemical etching, micro-drilling, and other material removal mechanisms, high aspect ratio machining, design and construction of the machining apparatus, and a wide range of applications. The new edition compares Micro-ECDM and SACE with other micromachining technologies such as laser machining and traditional EDM. ECDM is used for machining of electrically non-conductive materials. Micro-ECDM/SACE is mainly applied to glass and the book focuses on glass, but the authors also present new results on other materials such as ceramics. In addition, techniques to modify material properties for the machining process are explained. The authors discuss machining strategies including the latest developments in micro-texturing of glass micro-channels and reports on developments in controlling and analysis aspects of machining. This book is a unique reference for engineers and industrial researchers involved in development, design and use of micromachining, chemical micro-drilling or chemical engraving techniques and equipment.